Percussion: The Cavaliers (16.9), July 8, Bowling Green, OH Color Guard: The Cavaliers (17.2), July 5, Dublin, OH Open Class: Brass: Blue Devils B (16.3), July 9, Fremont, CA Percussion: Blue Devils B (16.5), July 10, Pleasant Hill, CA Color Guard: Blue Devils B (15.7), July 10, Pleasant Hill, CA View all scores and recaps. • After a week off, Blue Devils B picked up its 2011 winning streak notching a pair of victories over the weekend. A 79.95 in Pleasant, Calif. marks the highest score of the season for an Open Class corps. • Blue Devils B's left coast rivals, the Vanguard Cadets, keep hanging tough against the competition, finishing only 1.4 points below BDB's high score of the week on July 10. 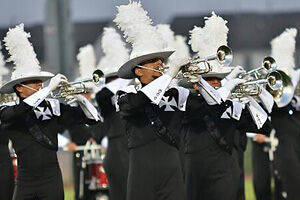 • In the first meeting of the season between the Crossmen and the Colts on July 8 in Bowling Green, Ohio, Crossmen edged the Iowa corps narrowly by .15. These two corps continue to put up scores in a relatively tight grouping with the Glassmen, Troopers, Spirit of Atlanta, the Academy, and others, already setting the stage for what looks to be a tight battle for the final spots among the top 12 at the World Championship Finals. • After four World Class corps passed the 80-point benchmark last week, two more corps followed suit this week including Phantom Regiment (80.7 on July 6 in Salt Lake City, UT) and the Bluecoats (80.55 on July 7 in Akron, OH). Now knocking on the door of 80 points are the Madison Scouts (79.6 on July 6 in Jackson, NJ), Santa Clara Vanguard (79.2 on July 9 in Denver, CO) and Blue Knights (78.9 on July 6 in Salt Lake City, UT). 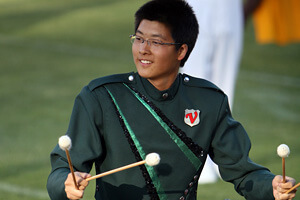 • The Cavaliers earned the high score of the week on July 8 with an 83.45. The next day in Madison, however, the corps dropped in score almost two points to 81.55, but on July 10 began picking back up with an 82.8. • The tight race between Phantom Regiment and Santa Clara Vanguard continues. Though Vanguard eked ahead on July 2 in Walnut, Calif., in four meetings between the two corps since then, Regiment has been on top. The Rockford corps was ahead this week by as much as 1.5 but as little as .35 when it scored 78.75 to Vanguard's 78.4 on July 10. 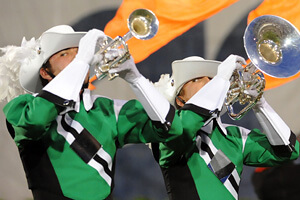 • Soon to factor into the tight race between SCV and Phantom Regiment might be the Blue Knights. BK finished just 1.05 under Santa Clara and 1.55 under Phantom on July 8 in Loveland, Colo. • The Cavaliers rendezvoused with the Cadets, Blue Devils, Phantom Regiment and Santa Clara Vanguard on July 10 in Omaha, Neb., for the first time since the first two events of the season in June. The Green Machine took top honors, scoring ahead of the Blue Devils by .95 and the Cadets by 1.05. In comparison the Cavaliers scored 1.8 and 1.75 ahead of those two corps respectively when they last met on June 19 in Austin. 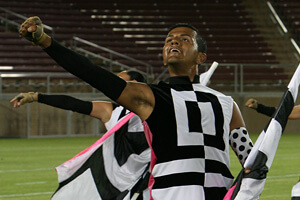 • On July 10, for the first time this season, Blue Devils finished ahead of the Cadets by a tenth of the point. Dominating their West Coast appearances throughout the early season, this is the Cadets' first loss in more than 20 days. Friday, July 15 La Crosse, WI Saturday, July 16 Ontario, CA Manchester, NH Minneapolis, MN Sunday, July 17 Malden, MA Rockford, IL Bellflower, CA Photos by Chris Maher, CorpsReps.com and Jolesch Photography.